THIS KILLER TAKES THEIR BREATH AWAY. A nine-year veteran of the FBI, special agent Mia Shields thinks she’s seen it all. But nothing prepares her for the terror that descends upon the idyllic bayside community of St. Dennis, on Maryland’s Eastern Shore, where a depraved killer has left a grisly surprise for Chief of Police Gabriel Beck: the body of an unidentified woman, naked and completely encased in plastic wrap, stretched across the back-seat of Beck’s car. Hidden in the wrapping is a tape recording of the victim’s last, gasping words, terrifying evidence of the horror endured at the hands of a madman. Soon the body count begins to rise as more victims are found, all gruesomely cocooned, their final pleas also captured on tape. Determined to catch the sadistic killer, Beck and Mia team up and set a trap–with Mia as bait. But their prey is closer than they ever could have imagined. Now Beck must race against time to save Mia from becoming the next victim of a serial killer as elusive as he is evil. 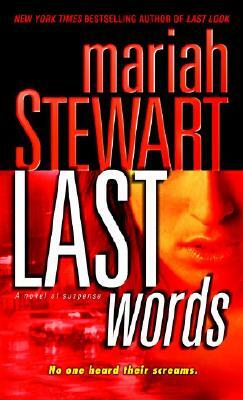 Mariah Stewart is the bestselling author of numerous novels and several novellas. She is a RITA finalist for romantic suspense and is the recipient of the Award of Excellence for contemporary romance, a RIO (Reviewers International Organization) Award honoring excellence in women’s fiction, and a Reviewers’ Choice Award from Romantic Times magazine. A native of Hightstown, New Jersey, she is a three-time recipient of the Golden Leaf Award and a Lifetime Achievement Award from the New Jersey Romance Writers, of whose Hall of Fame she is an honoree. Stewart is a member of the Valley Forge Romance Writers, the New Jersey Romance Writers, and the Romance Writers of America. She lives with her husband, two daughters, and two rambunctious golden retrievers amid the rolling hills of Chester County, Pennsylvania.